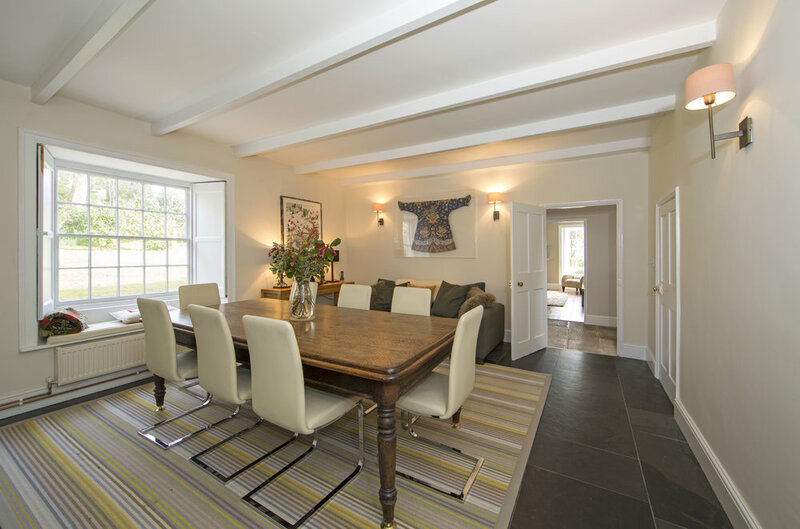 Penrose Farmhouse lies in a small rural hamlet in an Area of Outstanding Natural Beauty just ¾ of a mile from the sandy cove of Maenporth, between the port and university town of Falmouth, and the beautiful Helford River. 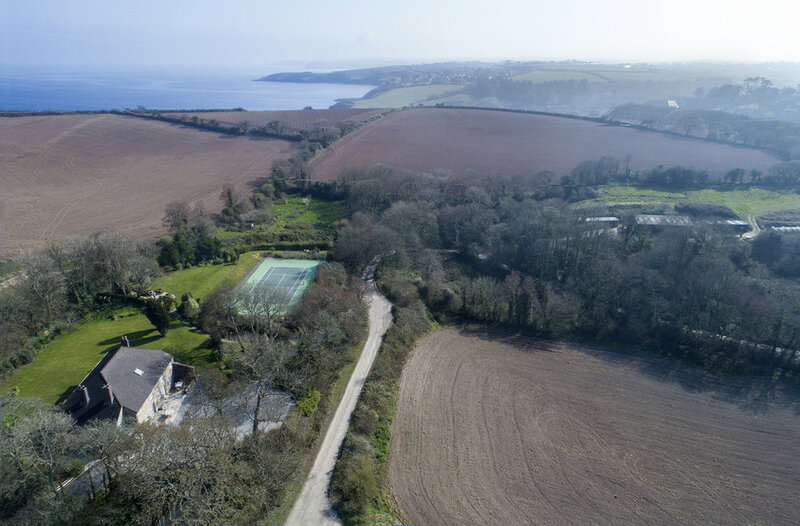 The property has far reaching views across surrounding countryside to the west and yet is close to the South West Coastal Path, above the western shore of Falmouth Bay. This part of South Cornwall is perhaps best known for its wonderful sailing waters with deep water moorings in the Helford River and Fal Estuary, besides yacht marinas in Falmouth and Mylor. The nearby beaches of Maenporth and Swanpool offer a range of watersports including paddle boarding and kayaking. The area has one of the most wonderfully mild climates in the United Kingdom, and some of the most spectacular gardens in the south west of England, including Trebah and Glendurgan – which are both about 3 miles from Penrose Farmhouse. For the golfer there are two 18 hole golf courses within five miles, including the Budock Vean above the north bank of the Helford River Estuary, and Falmouth Golf Club is just one mile from the property. Listed Grade II and believed to have been built in the early 1800’s, it is thought it was probably extended and converted to three cottages in the mid 19th Century, but then later reinstated as one house. Penrose Farmhouse is a very rare example of a Georgian house built so close to the coast in this part of Cornwall. Penrose Farmhouse is a gorgeous example of a classic Georgian former farmhouse, Listed grade II, and beautifully maintained both inside and out. There are many wonderful features typical of a house from this period including sash windows with window seats and shutters, and granite and slate flooring. 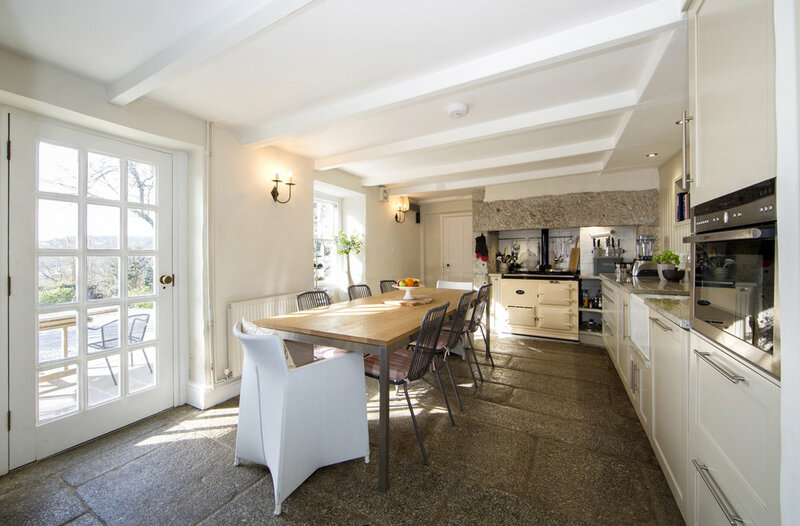 The kitchen/breakfast room has an oil-fired Aga and walk-in larder and there is also a door out to the front terrace. Off the boot room are a cloakroom/WC and a back door leading out to the garden and pergola, where there is an outdoor shower, ideal for those returning from the nearby Maenporth beach. Off the hallway are the dining room and sitting room; both have original sash windows and wooden shutters. The sitting room has a Jetmaster open fireplace whilst the dining room has a wood burner set in a large fireplace. Beyond the dining room is a snug or office/study and a utility/laundry. 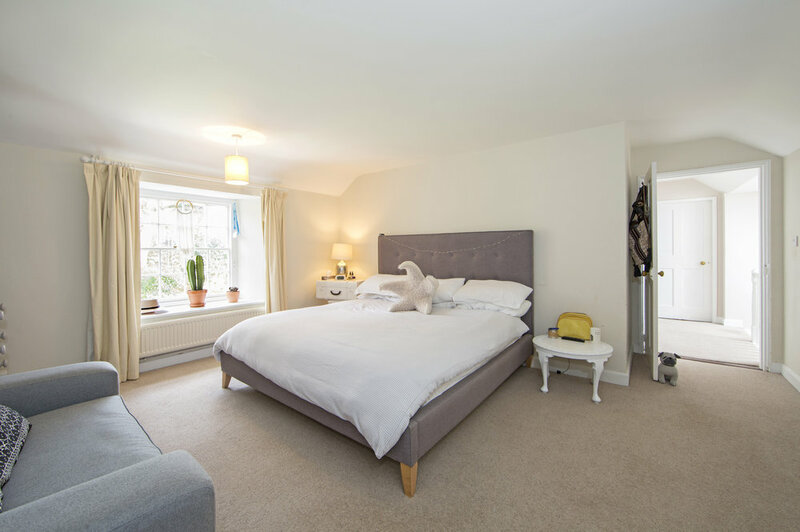 On the first floor there are five bedrooms, with the master bedroom having a fabulous en suite shower room, and another double bedroom having a nursery/dressing room (or study) attached. A secondary staircase gives access to one of the bedrooms allowing the option of guest accommodation. The property is approached by a lane shared with just the farm and five other dwellings, which gives access to a private gated entrance leading to Penrose Farmhouse. Beside the large private parking area are both an attractive oak-framed open-fronted boathouse and a single detached garage/workshop. The garden and grounds extend to about 1.2 acres and are filled with mature, established trees and shrubs including hydrangeas, camellias and azaleas to name but a few.